Valentine's Day Art! | Art Sphere, Inc.
Talk to the kids about Valentines Day, what it means to them and who do they think of? 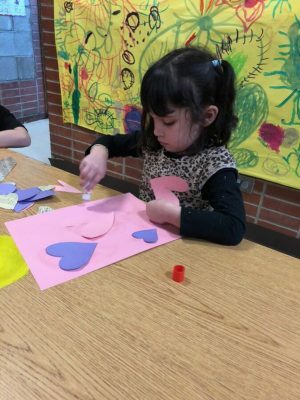 Hand out paper and let the children choose their own already cut out hearts of all different sizes. Give them glue to apply hearts to paper, write who they want the love letter to go to and let them spell out words. Collect letters, and spread large paper over tables and let the kids work together to create a large painting with paint sticks. Yesterday at the Cione Recreation Center and today at the Fishtown location we had an early Valentine’s day themed crafts for the kids. At Cione, the kids made collages of hearts on pink and purple paper, and were allowed to write whoever it was to on the front of it. So it was similar to making collage cards for their loved ones! They enjoyed piling the different hearts on top of each other and having Miss Cara write a note on the front. After that we did another form of collage where the kids were allowed the freedom to draw together on large yellow sheets of paper we laid out. All together they shared the paint sticks we had gave them and proceeded to make two large colorful murals together! At Fishtown the kids also made collage cards of hearts to give to their loved ones as well, but had a different day compared to the Cione kids. For the Chinese New Year, Miss Cara had a cool craft idea of making paper lanterns! The kids got to decorate the paper lanterns with sparkled golden paint, which needless to say, was slightly messy but a great time for the kids! Once they were done small groups of the children were complimenting the work they had all done and holding them up proudly. We finished off their paper lanterns by punching holes in the top and attaching strings to them so the kids could hang them in the future. Share the post "Valentine’s Day Art!"